My dearly departed grandmother was in no way the inspiration for my obsession with food. One could say I am a foodie in spite of my grandmother instead of because of my grandmother. I have strong memories of her particular way of cooking skirt steak in the toaster oven, particularly bad that is, and I also have strong memories of dishes I really did not partake, but learned about through my dad, especially her vile cornflake chicken and her viler brisket. To this day, with just a bit of egging, my dad will describe in loving detail the three day process of over-cooking, soaking with whole onion, and leaving in grease that produced the treat that was my grandmother's brisket. Ask him. Yet, yet, as I say, everyone has a dish, their cole slaw, their source of redemption. My grandmother's was jello, preferably en mold. Her motto was, you always have room for jello. Well, yesterday, as we were wrapping up an ample sampling of the dim sum at Happy Chef, they came around with plates of whole, head-on, salt and pepper shrimps. And of course, who does not have room for Happy Chef's salt and pepper shrimps, head-on. I've always known, of the places I have tried in Chicago, that Happy Chef's were the best salt and pepper shrimps. These are shrimps to make you crave shrimp head. Fresh, crisp, slightly spicy, not marred by grease. You eat everything but the last bits of tail. 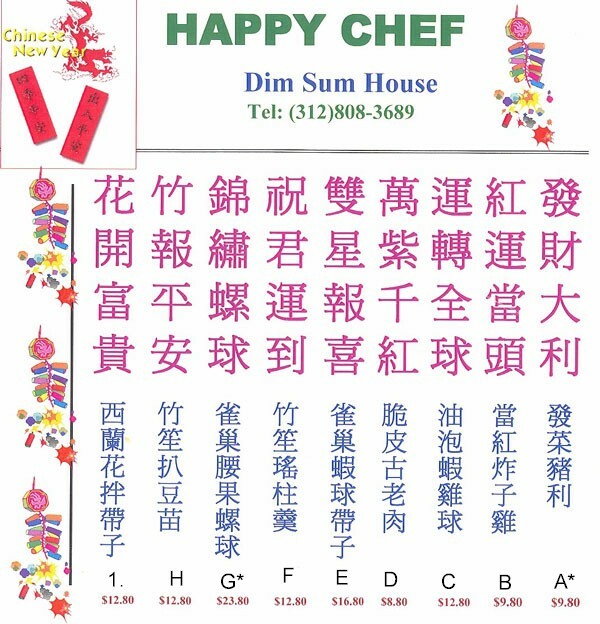 I've not know about the dim sum at Happy Chef until yesterday. I would say that not everything rose to the satisfaction of the whole shrimps, but it was a very well done dim sum nonetheless. Solid. It is a hybrid dim sum. There is a sheet to fill, with choices, like most of these sheets, that do not make full sense. There is shrimp dumpling and steamed shrimp dumpling (both in the steamed category); baked egg tart and baked custard egg tart, pan fried pork bun and pan fried pork dumpling. 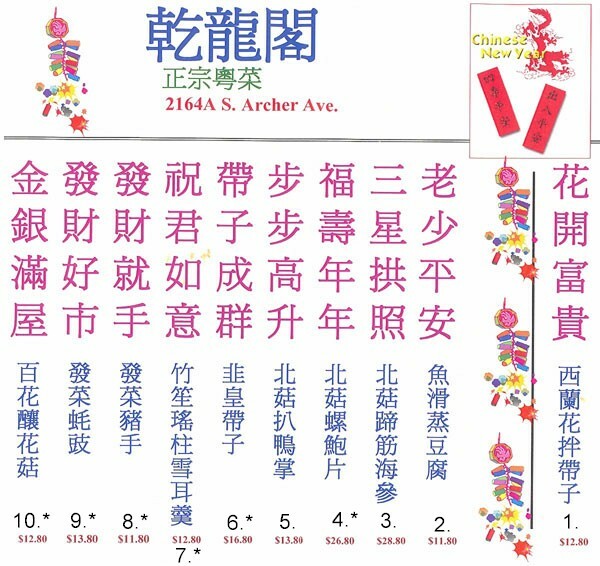 And you think that's confusing, there is also a 2 page listing of mysterious noodles with offerings like hong tol e-fu noodle and ha-moon rice stick noodle. We got the hong tol e-fu noodle just to see what it was, not big deal at $3.88, Still, there are a few things in plates, off menu, that get paraded around the room. We had filled up pretty well. From the sheet we got some really good shrimp with pea pod green dumpling in a yellow wrapper and ultra hot steamed shrimp dumpling puffing with shrimp air. 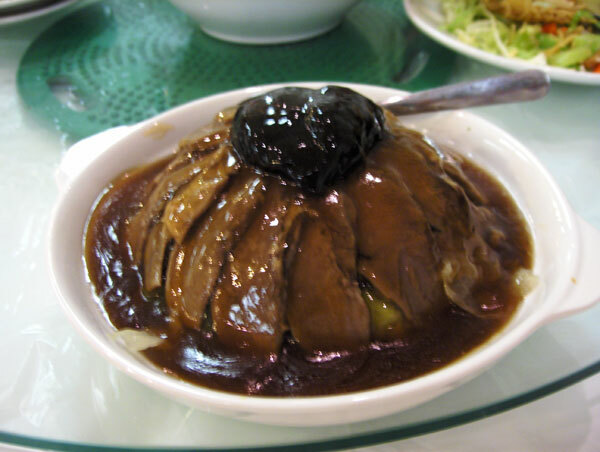 I liked the eggplant slices with black bean more than the Condiment Queen that came from the pass-arounds. Sesame balls, also off-menu, were chewy and big. 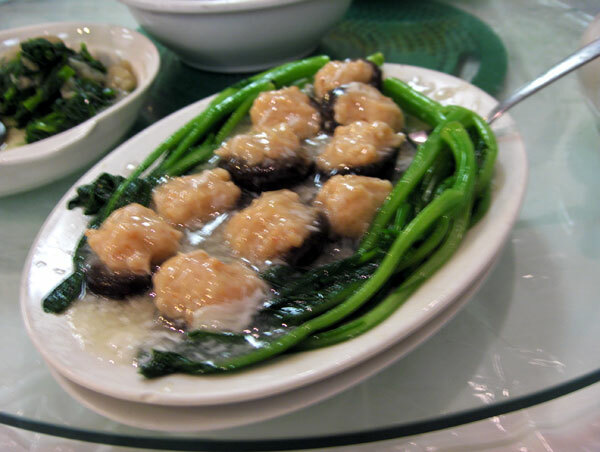 We passed on the Chinese broccoli in oyster sauce because, based on sight and aroma, we mimicked a nearby table and got a big plate of Chinese broccoli showered with garlic. 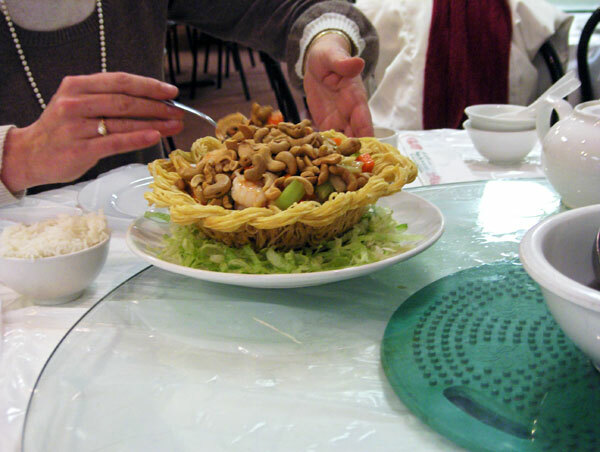 Those hong tol-e-fu noodles were a big old bowl of thick chewy noodles underneath a layer of egg white. It turned out to be a good way to get some protein into the chowhoundita who was with us (the other on a birthday jaunt to Navy Pier). We were past full when they started passing the salt and pepper shrimps around the room. Who, however, does not have room for Happy Chef's salt and pepper shrimps. The great news, especially for the chowhoundita, was the extra ten minutes needed to eat the shrimps also kept us there for some very hot, very fresh, very delicious custard filled, sweet top buns. Happy Chef may be a great, probably the best, Cantonese style place in Chinatown, but do not go there for creature comforts or atmosphere. Ms. VI complained all morning about the plastic tablecloths sticking to her knees. A small price, alas for making room for salt and pepper shrimps. It has been sadly reported that the delicious Mandarin Kitchen recently closed. Well, a restaurant has recently opened in its place. It is called, well in English, it is still called Mandarin Kitchen, yet in place of the former Szechuan style place, is a Shanghai style place. There is the full range of typical Shanghai stuff on the English menu including two kinds of soup dumplings, various cold dishes, pork leg, lion's head meatballs and eel. There is also a nice sounding deal of 3 dishes for $22.95. The women I chatted up were very nice. I'll give it a scout and if its good, maybe arrange a group meal. Thanks for the report, it sounds great! I have obviously never had good S&P shrimp as the ones I've had have needed de shelling. Do the good places cook them so that the shell actually crisps up so you can eat it? I've become very good at popping them outta their little shells quickly but I always feel like a Philistine when I leave the pile of shells. Octarine wrote: Thanks for the report, it sounds great! I have obviously never had good S&P shrimp as the ones I've had have needed de shelling. Do the good places cook them so that the shell actually crisps up so you can eat it? I've become very good at popping them outta their little shells quickly but I always feel like a Philistine when I leave the pile of shells. Yea, the flash frying process renders the shell crisp enough to be entirely edible. Better then the edible shell though, is the edible head. Its where you'll find a big plop of shrimp fat. Once you put the whole thing in your mouth, the gross factor is gone. Try it. I have to agree with VI regarding the eating of the shell. I have eaten the S & P Shrimp without the shell at Little Three Happiness upon several occasions and loved them. I tried them with the shell not long ago at Little Three Happiness and found a much greater depth of flavor with the shell. In some ways its like eating traditional southern bbq with the crisped up skin chopped into the meat giving you that extra bit of flavor, texture, and crunch. Even my wife enjoyed a few with the shell and she is pretty squeamish regarding things like that. During my last lunch at LTH on Sunday three women visiting from North Carolina ended up eating at our table. I recommended the S & P Shrimp and they loved the texture and flavor of having the shells. They were also very impressed wtih the quality of the food at Little Three Happiness. Last edited by Bruce on June 29th, 2004, 9:50 am, edited 1 time in total. Vital Information wrote: . Well, yesterday, as we were wrapping up an ample sampling of the dim sum at Happy Chef, they came around with plates of whole, head-on, salt and pepper shrimps. And of course, who does not have room for Happy Chef's salt and pepper shrimps, head-on. In all my (many) visits to Happy Chef for Dim Sum, I've never come across anything being shown around the room for the taking. It's always been an order off the menu type place. When did they start bring food around "ala carte", so to speak? I have no idea if this is a Sunday thing or a recent incarnation or maybe just something that decided to do last Sunday. It was good enough dim sum that I'd return, but on a purely food basis, probably not as good as Phoenix. On the other hand, it is a lot cheaper, and a lot less hassle. It must be a Sunday thing. I've only been during the week and have never seen pass arounds. Head-on shrimp is one of my favorite dishes, and I've yet to find a better rendition than, of all places, Phoenix Inn in downtown Evanston. Once I was able to convince the owner that, yes, I do like them with the shell on and spicy, I've never been disappointed with their version (usually ordered carry-out.) On a par with LTH, IMHO. I went to Happy Chef for dinner this evening with Helen and fifille. Parking was not too challenging. Despite this being the Chinese New Year, the restaurants were not too crowded. We decided to order two entrees, which allows us to have lobster or crab as a 3rd entree for free. fifille ordered the duck casserole, which the waitress assured it wasn't for her. Recognizing this might really mean: Chinese people like it, but American's don't. I inquired, "Do you mean as an American she won't like it?" "Yes, there are all these bones. Americans don't like it." In unison we began to explain, "We are not normal Americans. We are sure we will like it." To be extra helpful, I added, "If we don't like it, that's ok because we will still pay for it." Our table was collectively energized by this near denial the waitress relented to allow us to order the duck casserole. If it were not for the sprigs of flat leaf parsley, this would be a study in brown. While the color palette is rather flat, the range of flavor and texture was considerably more vast. There were shiitake mushrooms, dried tofu, bok choy and chopped duck parts in a brown sauce heavy with Chinese star anise. We ate more than half to prove to the waitress this was a well received dish. The remainder went home with me for another day. It is almost tempting to play menu roulette: just point and see what arrives from the kitchen. That casserole sounds great, Cathy! After an abysmal meal at Burrito Amigo earlier today, I made my way to Seven Treasures for my customary Scrooge-meal of barbecue pork and fried egg over rice on my way back from choir rehearsal (when there's company, it's Double Li or LSC; on my own, it's 7-T, and then straight to bed). I am not remotely a Chinese speaker or reader without help, but I have the characters for Beijing (characters "north" and "capital"), Szechuan (characters "four" and "rivers"), Nanjing (characters "south" and "capital"), noodle, pork / pig (often written with the character that literally means 'meat'), duck, chicken / fowl, shrimp, scallion, and bun memorized, and they are all very easy. So are one, two, and three (almost always horizontal slashes, like the "three" in the first row of your top image, southeast of the period in Archer Ave.). Even if you have the types of meat memorized, you can pick out certain things like knowing that the sixth item over in the top image (bottom section of the top menu, $13.80) contains duck, and probably Peking Duck, since the character for "north" is at the top of the lower set of characters. Since for menu purposes Mandarin and Cantonese are written virtually identically, a few characters go a long way. I don't have time at the moment to look up all of the characters (especially with our community's many native readers and scholars much more advanced than I), but you'd be shocked how quickly you could figure out at least what category those columns are if you check the McCawley and make yourself a cheat sheet. Last edited by Santander on February 7th, 2008, 11:55 pm, edited 1 time in total. Cathy - You forgot to describe the second part of our discussion our server. When she came around to see how we were enjoying our meal, we all strongly reassued her that we loved the duck which brought a wide smile of relief to her face. She then told us of a customer of hers who had been very disappointed by the quality of the food in Beijing. There was no Chop Suey or Egg Foo Young to be found! This had us all four laughing heartily. If we ever have her as a server again, I bet she won't try to disuade us from trying dishes with bones again. I like the Eater's Guide to Chinese Characters. Another good book for getting a basic vocabulary of characters is Swallowing Clouds. In fact, I have found this book more helpful than Eater's Guide (although, to be honest, I haven't gotten very far in Eater's Guide yet) because it gives a cultural context for the characters and how they developed. Having this context helps me remember them more easily. again, did the best i could. if anyone finds mistakes, feel free to correct me. Sunwah, thanks so much - and welcome! Bless your heart! Thank you for doing this. 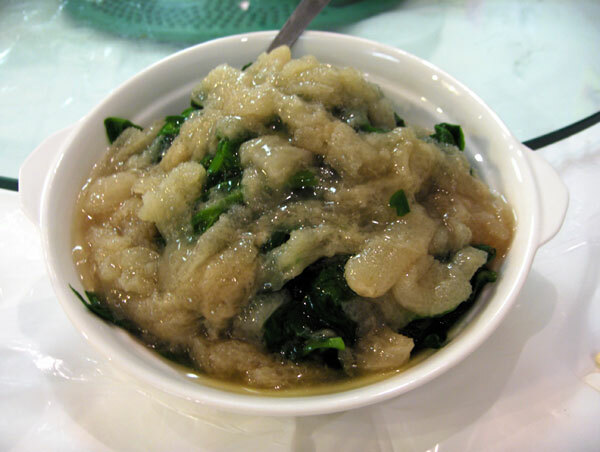 Does Sun Wah have an exclusively Chinese menu? If yes, then please consider scanning and translating it. People here love having access to menus just beyond our reach. A copy of your effort today is going to our translated menu thread. If anyone does pursue these dishes, then please take a picture or describe them. Underneath the web of bamboo shoot skin was a very generous quantity of peapod tips. While this was the only dish we selected that could be ordered anytime. We selected this dish purely for its name and would do it again, though I am not sure of the standard menu name. 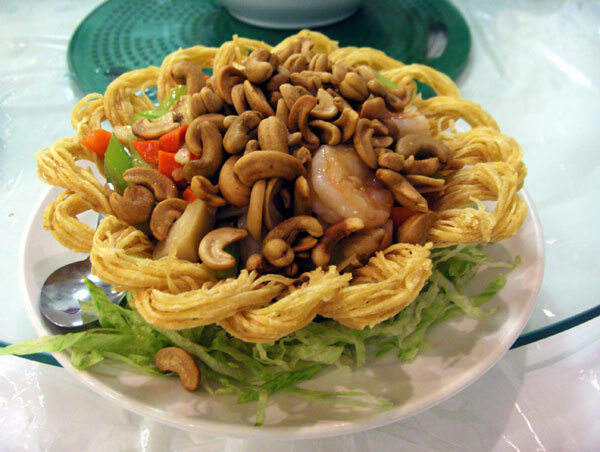 A stunning visual presentation of deep fried woven noodle basket filled with shrimps, cashews and vegetables. We took some of the fillings, then broke off a piece of the basket to eat with the filling. 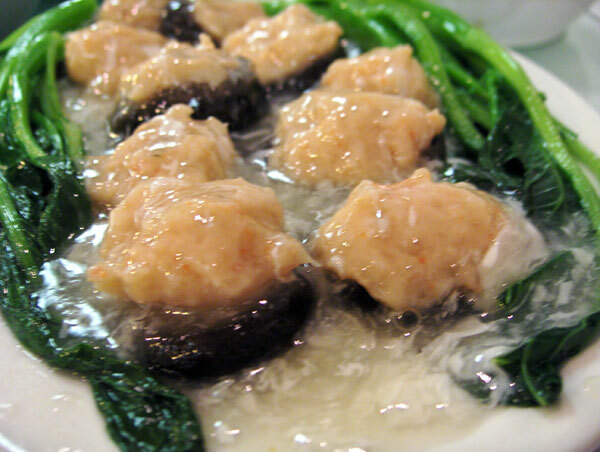 Braised shiitake mushrooms filled with a minced shrimp filling surrounded by Chinese brocolli and covered by an egg white flecked sauce. These were something I will be glad to order again next year. 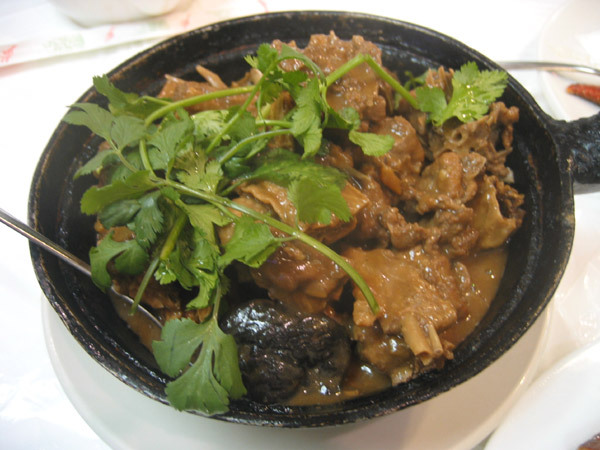 The nob on top is a braised shiitake mushroom with moss underneath. Inside the carefully arranged sliced braised pork tongue was cooked lettuce in a light sauce. This year has certainly been the best culinarily observed Chinese New Year I have yet to experience. Thanks again to Kelly and the Cheng family of Sun Wah BBQ. Kelly touched tonight's dinner by her generosity to translate Happy Chef's menu making the unapproachable very approachable. 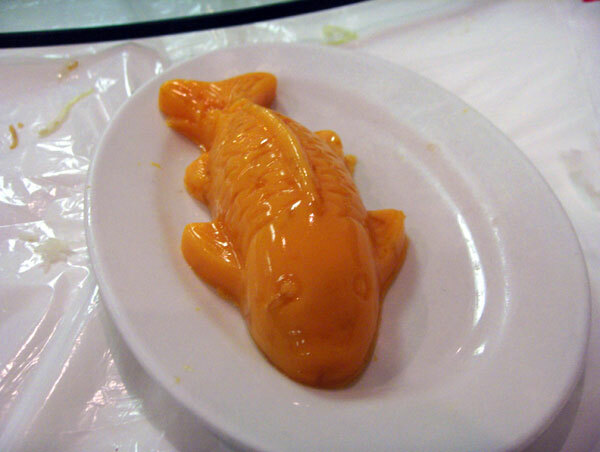 This type of "mango pudding" is usually served with evaporated milk poured over it at tableside. I really like it that way because the milk makes the pudding taste even richer. Did they offer? Yes, they did. The evaporated was brought over in a small bowl after the picture was taken and the fish divided. Wow - what an exciting opportunity! I am particularly interested in the embroidered silk ball, that looks delicious. What did the nest part taste like - was it simply a fried noodle, or was it seasoned in some way? Mhays wrote: Wow - what an exciting opportunity! I am particularly interested in the embroidered silk ball, that looks delicious. What did the nest part taste like - was it simply a fried noodle, or was it seasoned in some way? Ultra crisp noodle very similar to the dried ramen soups packets, which also happen to be deep fat fried noodles. I used my noodle as a scoop early on, then ate it. OK, not new year's, but following CrazyC's direction we wound up at Happy Chef for dinner...and the person at the next table looked awfully familiar...and then she said, "You look awfully familar," and it was, of course, none other than CrazyC! It was terrific fun having a meal with friends entirely by accident - and it didn't hurt at all to have CrazyC tell the wait staff that we "weren't normal white people" so we didn't have any trouble ordering the more authentic Chinese dishes - though I got the impression that they wouldn't have given us a hard time after Sparky so eagerly asked for Ma Po Tofu. Very, very nice experience all around; I definitely want to come back for Dim Sum. Then CrazyC, the spouse, Sparky and I all went to Joy Yee's new sushi/yakitori place and had yakitori chicken skin, meatballs and a bunch of sushi for dessert. Happy Chef is jumping on the hot pot bandwagon! The hubby and I went last night (to finalize the Xmas eve dinner) and to try it out! $40 for two people. They had 3 different sets: lobster, crab and live fish. 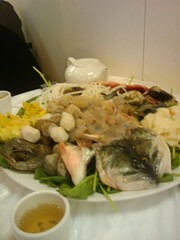 Crab and lobster was deemed too messy so we opted for the live fish with 2 broths (ma la and preserved egg & cilantro). The set included a live fish (big mouth bass), Guilin rice noodles, spinach (forgot to request watercress instead), shrimp, sliced fatty beef, beef balls, fish balls, housemade dumplings, blue crabs, clams and pork liver/kidneys (we subbed tripe for this). All in all, a pretty good dinner. If I was craving more meat in my hot pot, LSC would be my choice. 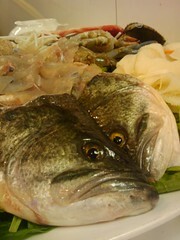 But the seafood is of a superior quality at Happy Chef. A friend who went to Chinatown for Easter reported Happy Chef has new owners and a new menu. It appears there is a new staff too, because she didn't recognize any of the wait staff. While a dish was prepared as requested with a crisp bottom. She suggested the cooks may be on a low sodium regime, because everything needed salt. I look forward to other's experiences. Oh no! We were there April 17th and old menu and regular staff was there. Dim Sum was super fresh and delicious as always. Hopefully the Easter visit was a blip.. I thought I'd try the S&P Shrimp at Happy Chef, as someone posted it was the best prep in Chinatown. That post, however, was a few years back. The place is now called the NEW Happy Chef. I have no problems eating shrimp shells and heads, however, in my opinion they should be crisp enough to disintegrate in your mouth for easy swallowing. The shrimp experienced at the New Happy Chef left a sodden pile of ground up shells in my mouth, that did not appeal for me to swallow. What's the deal with this shell stuff? I'd find the information useful for future ordering practices. We went to Happy Chef 2 weeks ago and everything was the same as it has been for us for the last 5 years, when we began going there. Same servers, same menu, same excellent dumplings and stir fried greens. I am sad to report that Happy Chef has closed its doors. I was at Shui Wah yesterday and Happy Chef was locked up tight with the windows papered over.